Charlotte, NC – Etienne’s first touchdown? A 75-yard touchdown run on the first play of the game – the fastest touchdown and longest play from scrimmage in ACC championship history. Pittsburgh’s first two tries were less than ideal three and out series – the first was uneventful, and the second set the stage for Etienne’s record breaking play. Three penalties and two poor plays put the Panthers in a third-and-28 situation when Isaiah Simmons strip-sacked Kenny Pickett. Christian Wilkins plucked the ball from the air and rumbled eighteen yards to the three-yard line; Etienne ran the last three yards to pay dirt and broke CJ Spiller’s record. At that point, the only concern was an odd 15-yard punt by Spiers (whom struggled on most of his punts, yet set an ACC Championship record with a 63-yard touchback punt). Clemson’s momentum appeared to be too strong to overcome. Travis Etienne’s two rushes netted two scores, and Pittsburgh’s offense was helpless. The Tigers were up 14-0 in the middle of the first quarter – but then the momentum turned. Darrin Hall’s 20-yard rush and Qadree Ollison’s 21-yard run placed Pittsburgh in field position to score points, and they settled for a 37-yard field goal by Alex Kessman near the end of the first quarter. The normally disciplined defense struggled to contain Pitt’s rushing attack, and the Tiger offense sputtered at the same time. Clemson’s two straight three and outs netted seven yards as the Tigers sank to 0-4 on third down conversions for the night. Pittsburgh’s second chance wouldn’t end in three points this time. Qadree Ollison appeared to rush for a 28-yard touchdown, but a review changed the result to a 26-yard rush to the two-yard line. An illegal substitution penalty on Clemson gave one yard to Pitt, and Ollison’s one-yard rush cut Clemson’s lead to 14-10. In the middle of the first quarter, it looked as if Clemson would run away with the game. In the middle of the second quarter, Pittsburgh was performing its notorious scare of elite teams. Clemson’s response? Beat Pittsburgh at their own game. Etienne’s third major rush of the game didn’t break any records, but the 45-yard scamper led the way for Clemson’s third score of the game. Feaster and Etienne ran five times for 25 yards before Trevor Lawrence lofted an end-zone fade score to Tee Higgins to extend the Tigers’ lead to 21-10 with just over a minute until halftime. 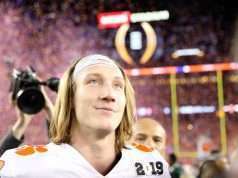 AJ Terrell intercepted Kenny Pickett’s third down pass and returned it 31 yards to the ten-yard line, where Trevor Lawrence threw his patented slant route to Tee Higgins for a ten-yard touchdown near the end of the half. What was once a 14-0 impending blowout evolved into a 14-10 defensive struggle, and Clemson’s end-of-half heroics put the Tigers up 28-10 going into halftime. The third quarter continued the rainy defensive slugfest, but the damage was done. For the first fourteen minutes of the third quarter, both teams combined for 68 offensive yards. With fifty-nine seconds in the third quarter, Lawrence and company finally clicked. A 21-yard pass to Higgins, an eight-yard scramble, and a 38-yard flea-flicker pass to Justyn Ross capped off the third quarter. Tavien Feaster punched the ball in from the one-yard line at the beginning of the fourth quarter to put the game out of reach with a 34-10 lead. In an odd sequence of events, TJ Chase caught Will Spiers’ punt when Rafael Araujo-Lopes waived for a fair catch. The odd play ended in two penalties on Clemson – a declined facemask penalty and an accepted 15-yard catch interference penalty. 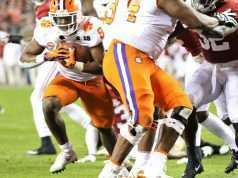 Chase Brice led Clemson’s last touchdown drive – Adam Choice’s 31 yard run, Brice’s 28-yard rush, and Lyn-J Dixon’s 4-yard touchdown run were the highlights of the drive that saw the Tigers cover the spread. Clemson held Pittsburgh to eight passing yards while outrushing the Panthers 201 to 192. Both teams struggled on third down (4/12 Clemson, 3/17 Pittsburgh), and neither team ran more than 64 plays. Clemson’s three one-play touchdown drives sealed the win and widened the score in an old-fashioned championship game, complete with Pittsburgh’s throwback unitforms. Call it ‘old school’ like Coach Swinney, call it a mud-fest, call it a grind it out game. 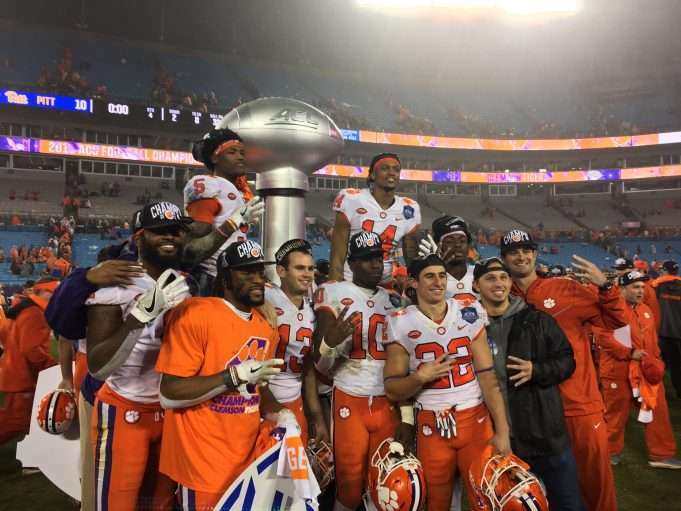 However you spin it, Clemson made history by being the only team to win four consecutive ACC Championships.